In lieu of the official fourteenth post, Best Convention Purchase, I’m just going to share my 2014 Gen Con haul! Starting in the top middle and going clockwise, we’ve got: Era of the Ninja! This is an advance shipment of a game made by my friend and fellow Wittenberg alumnus Eric Ebbs! I actually did some of the art for the game when it was in alpha and playtested it once or twice at the Witt RP Guild’s Saturday Board Game Night. I’ve heard that Ebbs has greatly refined the rules since then, and he was able to Kickstart the game and get a real artist to do the final art of the various ninjas and lords. I’m looking forward to playing it with my L5R gaming group soon. Path of the Planeswalker was given to me for free by a friend who had gotten it and a bunch of other books in a trade. I still want to run that Planeswalker/Multiverse RPG campaign someday, so I can hopefully use it as some source material for the kinds of adventures I’ll be running my players through. Next is Cold Steel Wardens, appearing for the first time corporeally! This is another game written by a friend and fellow alumnus, Andy Klosky, and I was a player in the original Heroes Unlimited campaign that prompted him to make his own system to support a Watchmen-style, Iron Age of Comics vigilantes game. Scheherazade, my character, is in the Rogues Gallery as a sample NPC, complete with secret identity: Katrina Ostrander! I’ve talked about Scheherezade in my Most Memorable Character Death entry, if you’re curious as to where that campaign ended up. 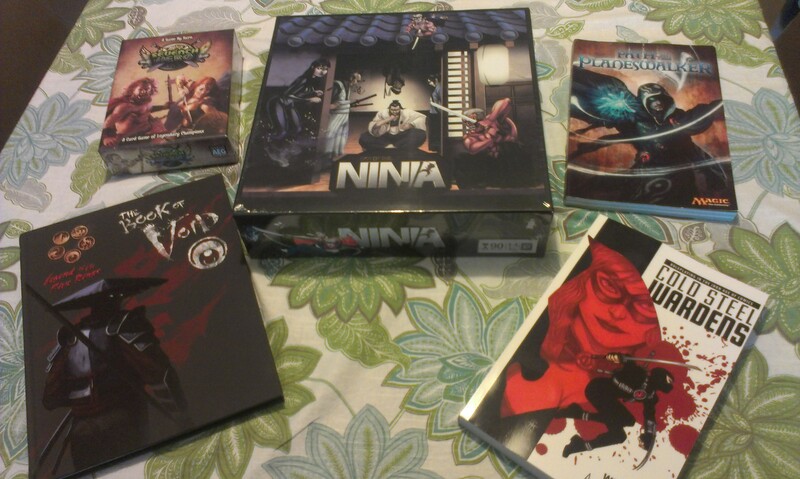 Finally, my AEG swag included both the Book of Void supplement for the L5R RPG and the card game Seventh Hero. The former would have been really useful for my Ishiken character, Isawa Miwako, before she lost her soul to a corrupted fox spirit in Chikushudo. I love quick and fun card games when I’m not feeling like I can focus on a long game, so hopefully I’ll get to play around with it soon. What was your best convention purchase, or what did you get from Gen Con ’14?